Avocados are an excellent and tasty way to get a highly nutritious food into your kids. Some of my kids don't really like them fresh, but make some guacamole and it disappears. Guacamole is a Mexican dish made from fresh avocados and different spices. It is great with many Mexican dishes as well as a fresh dip with some tortilla chips. It is essential when making seven layer dip. There are other ways to use them as well, which you can find a few at the end of the post. 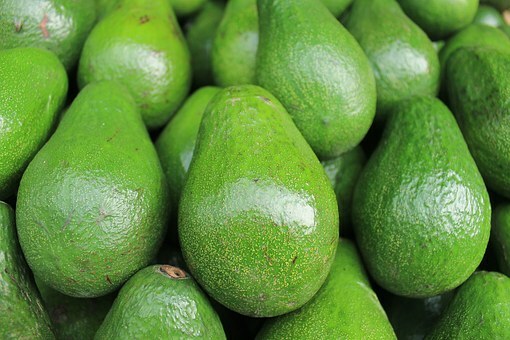 When shopping for avocados, you will generally find two kinds, the Hass which is predominantly grown on the West Coast and the Florida avocado. 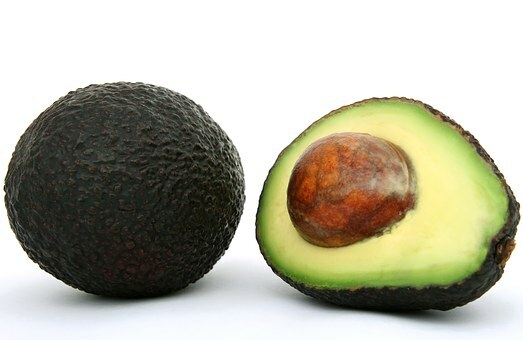 The Hass is smaller, has a dark, almost black as it ripens, rough skin and the Florida varieties are larger, almost double the size of the Hass, and have a green, smooth skin. I would liken the Florida varieties similar in appearance to a mango. You can use either variety interchangably. You will usually find them under ripe in the grocery stores. Simply leave on your counter for a couple days and it will be ripe when it softens to gentle pressure. Once ripe, put in your refrigerator or it will quickly over ripen. You will be able to tell an over ripened avocado when you cut into and the flesh has blackened. So what do you do with them once they ripen? We all like guacamole, so eating it is no problem, but when all of the avocados ripen at the same time, you either have to eat them with everything or you can freeze them. Yes, avocados can be frozen. In fact, many restaurants buy them that way for use on their menu. Commercially, you can get them halved, skinned and pitted or pureed for making guacamole. They are IQF (Individually Quick Frozen) which helps preserve their integrity better than just putting them in the home freezer, but for our purposes, simply freezing them works fine. I find that making guacamole and then freezing it works very well. Remember to freeze it in containers that are just the right size for what you will eat at one time and not in a huge batch. Once the guacamole thaws, there may be some separation of liquids in it, but you can simply stir it back up and it will be fine. You can also half, skin and pit them and then put them on a wax paper lined sheet pan in the freezer. Once frozen, put in a zipper bag and pull out for use as needed. The easiest way to remove the flesh from the halved, seeded fruit is to use a tablespoon. Simply slide the spoon along the skin, separating it from the flesh and you should have am entire half of an avocado. Simply slice or mash according to your use. There really is no need to go out and buy an avocado knife or special avocado tool for removing the flesh. The avocado is extremely nutritious and are one of the highest sources of monounsaturated fat (which is good for you). High intake of avocado has been shown to lower cholesterol levels. 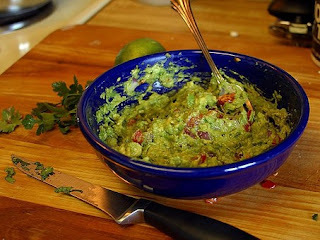 There are numerous ways to make guacamole and no one way is right, just what your preference is. Here is our basic recipe. 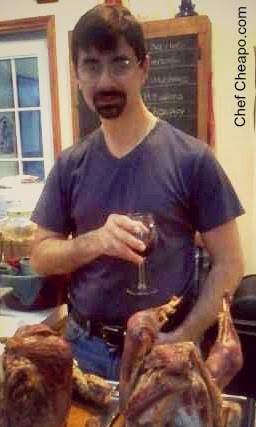 Feel free to adjust to your taste. Add all of the ingredients to the mashed avocados, mixing well. If fresh garlic seems too overpowering for you, substitute 1t of granulated garlic. Taste and adjust as needed. Other ingredients that can be added include chilis, scallions, chili powder, coriander, cumin and cilantro. That's it!! Simple!! I bet once you try it and see how simple it is, you won't pay $3 for an 8 ounce package in the produce case again. If you buy the avocados on sale, you can prepare twice the amount for what you will pay for prepared in the store. Yours will also not have the preservatives in it either. Remember that air is the enemy, so unless you keep it well covered, it will start to turn brown. Put the finished guacamole in an airtight container and before sealing, put a piece of plastic wrap directly over the guacamole and get out any air bubbles. This will slow the process of it turning brown. The added acid (lemon or lime juice) also works to slow this down. 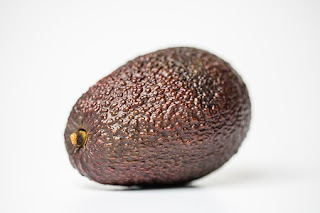 Other good recipes for using avocados are chocolate pudding, avocado cucumber soup (it is served cold and is a refreshing summer cold soup) and chocolate caramel avocado brownies. This post has affiliate links contained in it.